Once in a while a recipe surfaces in a place where you don’t expect it. 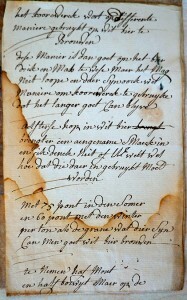 Earlier this week I was asked if I had already found a historical beer recipe for every Dutch region. I haven’t got that far yet, however. Sometimes I can be a bit jealous of a country like England, where there is a vast corpus of old brewing records, in which people like Ron Pattinson can browse to their hearts’ content, and in which they can follow clear trends from decade to decade and from one place to another. 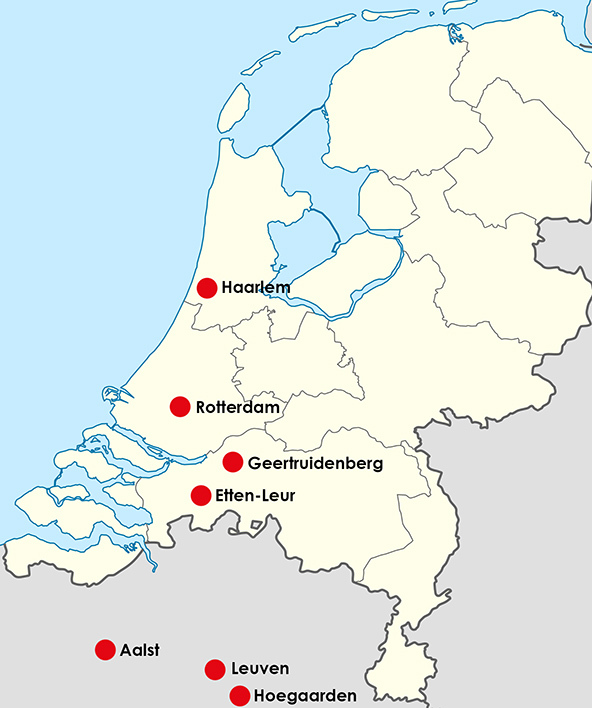 The brewing records to be found in The Netherlands are very fragmentary and still very incomplete. I won’t be able to present you a ‘princesse beer through the years’ anytime soon. Most ‘old style’ breweries were outcompeted to death and then closed at the end of the nineteenth century, after which all paperwork ended up at a garbage dump or in a kitchen stove, save for a few fortunate exceptions. Therefore I have to use the sparse data available – and search very carefully. Otherwise I would not have found this recipe from Etten-Leur, strangely enough in Rotterdam. 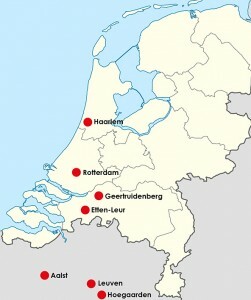 White beer was quite typical for Brabant, a region split between the Netherlands and Belgium. The most famous example is Hoegaarden, but also Leuven had its own white beer, called Peeterman. The town of Geertruidenberg used to be in the province of Holland but was next to the border with Brabant, and it had its own ‘Bergs’ white beer. Even the Scheepje brewery in Haarlem, far away from Brabant, made a brew of ‘Brabants witbier’. 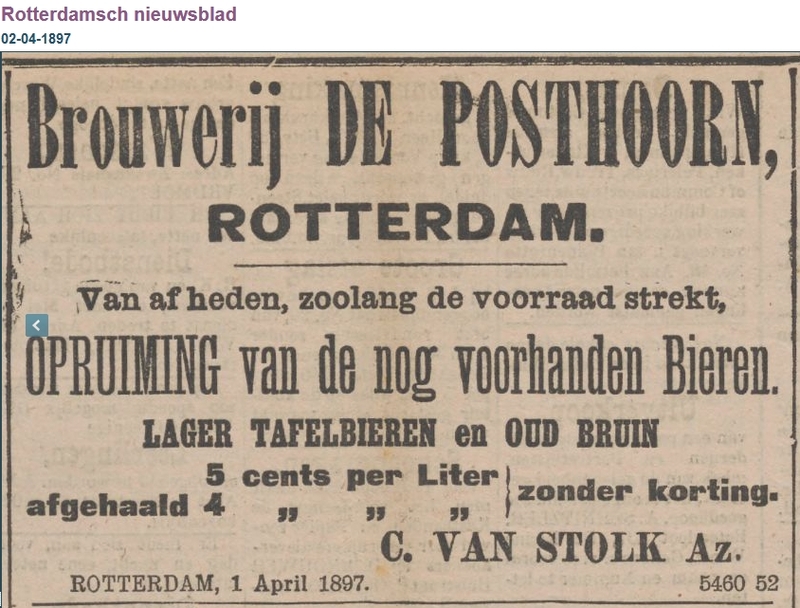 For a bunch of useful reasons I was browsing through the Posthoorn brewery archive at the city archives of Rotterdam, also not in Brabant. This brewery was, if I’m not mistaken, founded in the eighteenth century and was situated between the Binnenrotte and Lombardstraat. The grains are used differently in this way to brew white beer. This way is then good for the beer to be thick and juicy, but it may not run and there are also ways to use grains so that it can stay good for a longer time. Hops from Aalst in white beer brings a pleasant taste to it and I don’t think you don’t know how to use it. With 75 pounds in summer and 60 pounds in winter per tun when the grains are somewhat expensive one can brew good white beer. To take half malt and half buckwheat but on a quantity of 25 tuns of beer take 6 ‘loopen’ or two ‘veertelen’ oats and as many of buckwheat less, and if you want to take another 6 ‘loopen’ or 2 ‘veertelen’ of wheat and also as many of buckwheat less, it won’t matter. In other words, in winter time they would add less grain because it was more expensive. 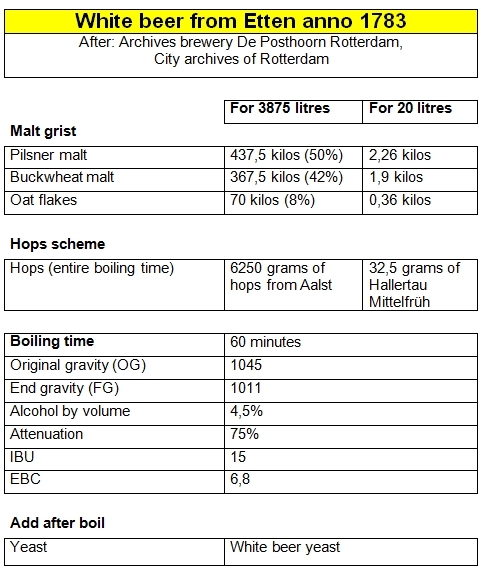 Half barley malt and half buckwheat, but per 25 tuns of beer six lopen (ca. 120 litres) or two viertelen (ca. 160 litres) oats instead of buckwheat, and some wheat if desired. A simple but fun recipe, especially because it’s such an unusual place to find beer from Brabant. Lesson learned: always pay attention when browsing old paperwork, they might just contain a beer recipe! 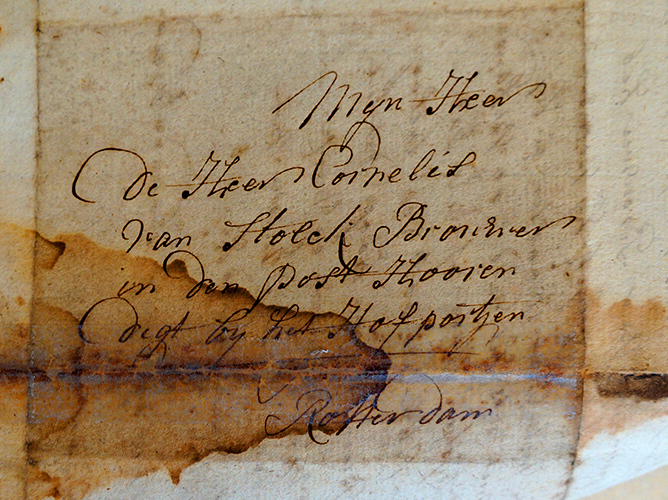 I should delve some more into the history of the Posthoorn brewery, but it seems that the Van Stolk family owned it until the end. 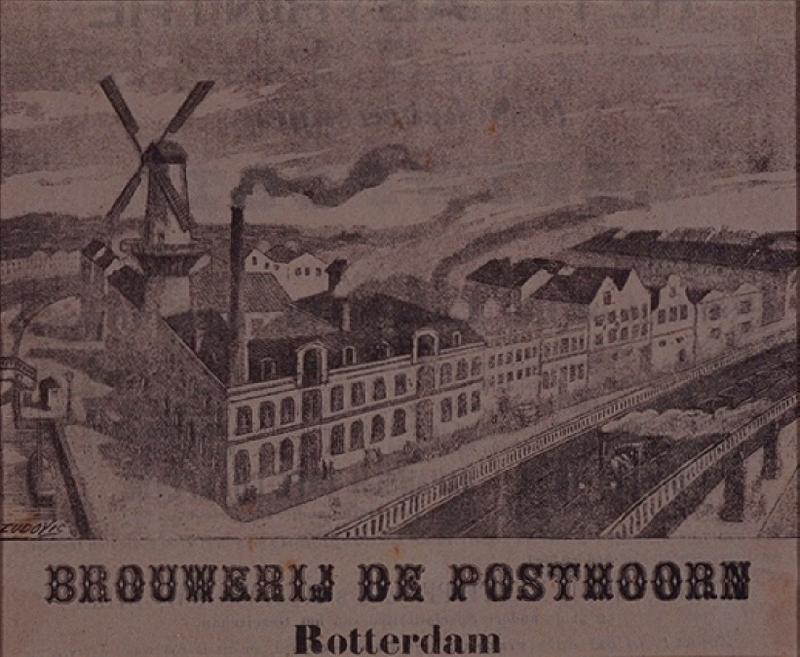 In the nineteenth century, the Posthoorn was for a long time the second biggest brewery in Rotterdam, after Oranjeboom. 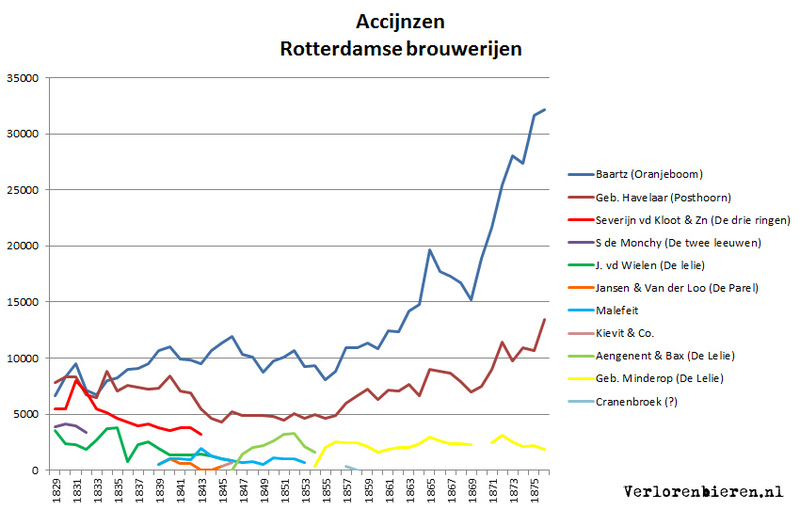 At first they were more or less of the same size, but from 1835 onwards Oranjeboom started growing while the Posthoorn lagged behind, as this graph with excise paid shows. 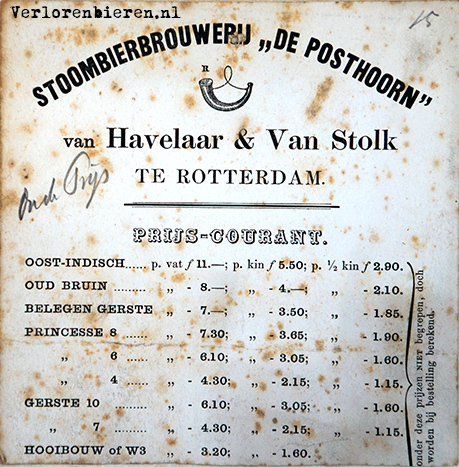 In those days, they made among others East-Indian, oud bruin, belegen gerste, princesse, gerste and haymaking beer, according to a price list from approximately 1873. 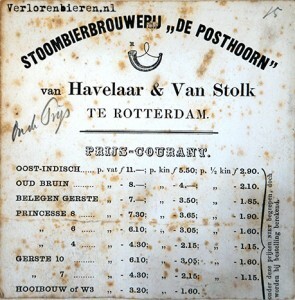 C. van Stolk Azn, probably a descendant of the aforementioned Cornelis van Stolck, put the last stocks of ‘Lager table beer and oud bruin’ on sale in April 1897. Afterwards the entire company was put on auction including the corn windmill ‘De Blauwe Molen’ (The Blue Mill). A few months later iron, oak and pinewood beams were advertised from demolished buildings from the brewery complex. 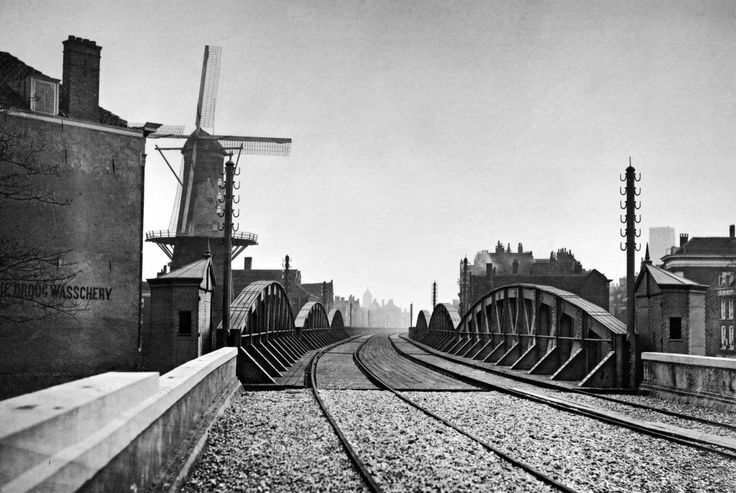 The Blue Mill remained intact until the Germans bombed the city in 1940, after which the remains were demolished. I would have liked to show you a picture of what the location looks like nowadays, but they rebuilt it so excruciatingly ugly that I can’t do that to you. If you’re interested: it looks like a prison courtyard, right where there used to be an almost 700 years old city. Sometimes architecture is just a crime against humanity. In a recent article in Dutch I wondered when the people of Rotterdam are finally going to demand a nice-looking city centre. Their city is worth it. 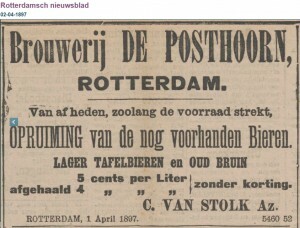 Described in this article (in Dutch): http://verlorenbieren.nl/een-brouwtje-brabands-witbier-in-1820/. 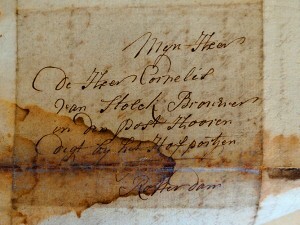 Stadsarchief Rotterdam, Archief van het Rotterdamse Brouwers- en Azijnmakersgilde 1670-1830, inv. no. 13. 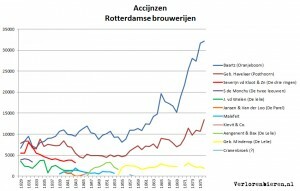 Stadsarchief Rotterdam, Archief bierbrouwerij Oranjeboom. 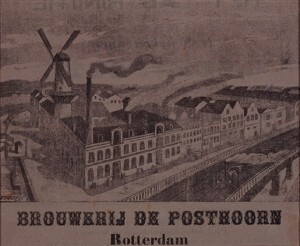 Rotterdamsch nieuwsblad 2-4-1897, 20-4-1897, 2-8-1897; Telegraaf 28-2-1897.